Reception class is taught by Mrs Gray and Miss Jewell is the teaching assistant. Information about the children’s learning journey can be found on our information for parents sheet and our class page below. We would all like to welcome you as your child starts their learning journey with us at St Mary’s Catholic Primary School. We know they will do some fantastic learning during their first year and have great fun along the way ! Visit our class page to find out more about the fun we have learning through play! Here is a picture of our class charter. During the first few weeks we will get to know each other and learn the school and class routines. 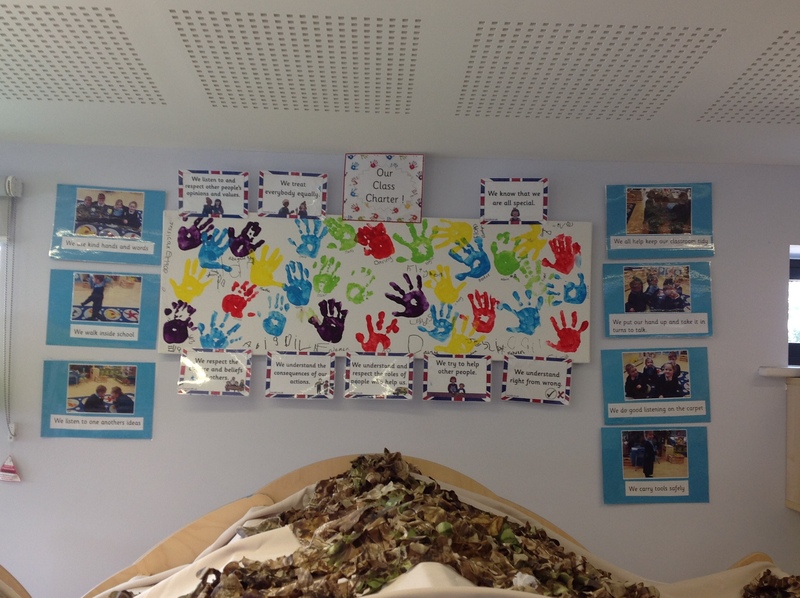 We will create our class charter and all sign it with our hand print promise ! When we create the charter we talk about two important words ‘rights’ and ‘responsibilities’. The class charter will help us to remember how we need to behave to make sure we all are happy, safe and do some brilliant learning. Autumn term Magic Me and The Jolly Postman and his Friends! Spring term The Elves and the Shoemaker and Materials and Jungle Boogie! Summer Term At the Bottom of the Garden and We Do Like to be Beside the Seaside! We use the ‘Letters and Sounds‘ scheme of work to teach phonics. The children will have a daily phonics lesson and will apply new knowledge and skills during their play at other times in the day. You can use your sound books to help reinforce what is being taught in school. Play underpins learning for our Reception children. During ‘Busy Bee’ Time (our planned child initiated play sessions) adults are close by, to support and lead children in their next stage of development and understanding. We are very fortunate to have a lovely covered outdoor classroom so that the children can access an outdoor curriculum throughout the year as well. Children may work in whole class situations, small groups, in pairs and on an individual basis with an adult. Learning will take place through adult led activities as well as child initiated opportunities. The Early Years curriculum includes 3 core areas and 4 specific areas. The core areas are: Physical Development, Personal, Social and Emotional Development and Communication and Language. The specific areas include: Mathematics, Literacy, Understanding the world and Expressive arts and design. You can find more details about how children progress through each of these areas by reading the Early Learning Goals section of this document. We feel that sharing children’s achievements is a very important part in building their self esteem, confidence and future learning. We are also aware that children are learning and achieving new skills at home. We like to celebrate these achievements during our circle time in school. Details of how to login to your child’s online journey will follow shortly. We look forward to hearing all about your child’s achievements and hope you enjoy hearing about their school adventures too! We encourage each child to build on their achievements by thinking about and sharing what their next steps in learning might be. The children enjoy completing weekly challenges during Busy Bee time. We also support them in thinking about how they are learning. In the classroom the children have access to dinosaur badges which they can wear to display how they think they have been learning. The children will then talk to the class about what they have been doing within their learning and discuss what their next steps might be. Use language of thinking and learning: think, know remember, idea, plan, learn, make sense, trying to do, or figure things out. PE kits should stay in school until each half term. Please name all items of uniform. Children should always have a coat with them. Wellies can be left at school and stored on our wellie rack ! Book bags, reading books and home link books should be brought to school every day. Please send your child with a fruit or vegetable snack for their morning playtime each day. Children self register each morning by moving their named superhero onto their named star !